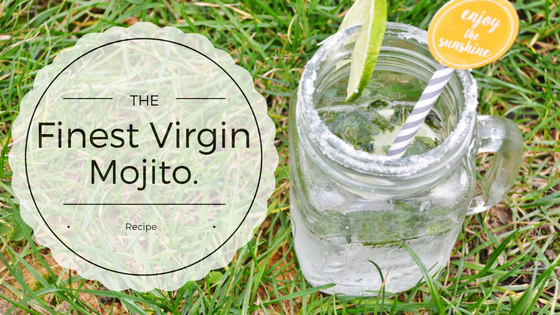 Drink up - The Finest Virgin Mojito Recipe. Ever since I got married, and I actually started cooking and experimenting with food, I wanted to do something new. With frequent house parties, I wanted to go past the fizzy drinks and soda cans on the table. I wanted to try something new. Since we don't consume alcohol, I decided to dial it down a little notch and introduce virgin mojitos during dinner parties. With trial and error, this is my most perfected recipe. I can easily make it in a bunch and pour it in a glass jar. It is delicious and always a hit! I usually freeze a few mint leaves in ice cubes, they add a nice touch to the drink and enhance the flavour as well. 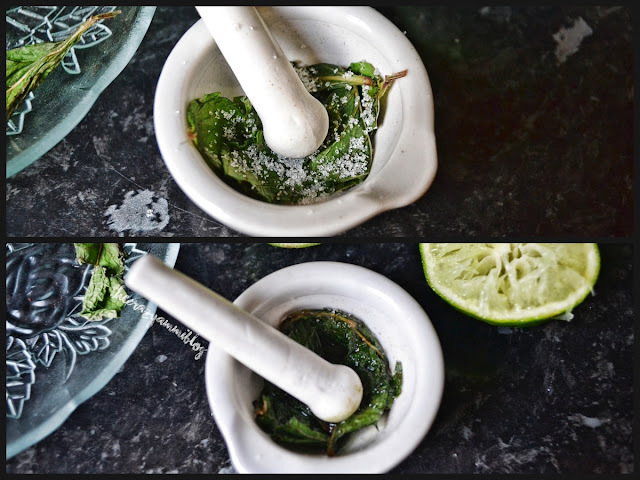 Take about 3-4 mint leaves in a mortar and pestle and add about two pinches of sugar. crush them and add add them in a glass. add a dash of lime juice some mint ice cubes and fill it the glass with sprite. taste it and add more lime juice to just the flavour. If you are serving the mojito in a glass, you can decorate it with rubbing a little lime juice on the rim of the glass and dipping the glass rim in salt. And add a little slice of lime to give it an actual mojito touch. There you go! Easy as anything and you don't even have to worry about getting it wrong! And I can assure you, it will be a hit amongst your guests during your parties. Do you have any other drink recipes that you always make? Let me know in the comments down below. I wish i liked Mojito's! They look so refreshing! I really like this drink recipe. It looks so tasty. This sounds great. I'm not allowed to drink much alcohol due to medication so I always go for mocktails over cocktails. I love cocktails, so will be giving this virgin mojito a try! This is such a great alternative to boring old pop at parties! Love the idea! This looks sooo delicious! that a great alternative! Woah it looks good & is easy aswell. This looks delicious! And making ice cubes with added mint - what a great idea! Lovely! As much as I enjoy a cocktail, I love the alcohol free options too! Oh I love this idea! They are my favourite drink but im not a fan of drinking alcohol. Perfect! I never would have thought to use sprite for a mojito! Oooh I bet this is so refreshing with the sprite the lime and the mint yummm. I'm totally gonna try this one time! I do love a mojito, so refreshing especially in the summer. Sounds really easy... and I love mint so this is a refreshing alternative. Can't wait to try it out. A great idea, you can now also buy 7up mojito which is really nice, although I still prefer the alcoholic version. Sounds perfect and something to think about for parties where non drinkers have a fun option. Perfect for e right ow! I love a mojito, but pregnancy certainly puts an end to an alcoholic version!